Madelyn's classroom at the daycare has a file box, with each file housed inside labeled with the child's name. It serves as a communication hub as many an important piece of paper has been collected or distributed there. Truthfully, it was so practical and "everyday" that I barely gave its usefulness a moment's pause, let alone consider how I could apply it to my life. But then ... the piles. THE PILES! The piles of random papers, of mail, of appointment cards - there is a constant pile on my kitchen counter that, despite our best efforts, seemed impossible to defeat. Pile of clutter, be damned. There is a file labeled with the name of each family member, a "Mail" file and a "Misc" file. It holds such "action" items as outgoing mail, mail to be sorted, bills I don't have synced online that need to be paid, and forms awaiting completion. The calendar clipped to the front will soon catalog our schedules for the month, and hopefully, help hold us accountable. It's such a painfully obvious concept of DUH! (at least to me) that I even feel silly for turning its simplicity into a blog post. But then again, I figured I'd share in case you were seeking an "aha!" moment of your own. Total investment? Less than $18. I found the mesh file bin at Target for $10.99 (similar from Amazon here) and the (set of 6) hanging files for $5.99. 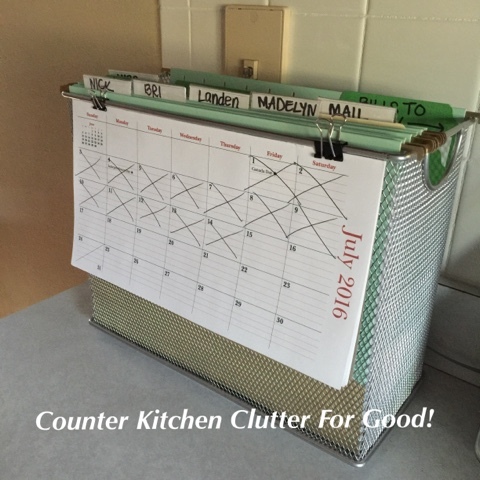 The calendar was part of a magnet sent to us by our realtor, which I adapted for its new purpose. But staying organized and on top of our necessary tasks? Priceless.